| Home | How to Take Care of a Rabbit | Do New Zealand Rabbits Make Good Pets? Do New Zealand Rabbits Make Good Pets? What is a New Zeland Rabbit? Despite their name, New Zealand Rabbits are actually an American rabbit breed from California that were developed in the early years of the 20th century. According to some sources, they were bred from a group of rabbits imported from New Zealand, but it is more likely that they are the result of crossing various meat rabbit breeds. Likely ancestors include the Belgian Hare and Flemish Giant. Over the last 100 years the New Zealand has been bred for size and to a lesser extent for color. There are both meat ‘production’ lines as well as show lines, but all New Zealand rabbits share a few key characteristics. They are 10 lbs to 12 lbs (5 kg) on average, and the males (bucks) are slightly smaller on average than females (does). They are known as good mothers and are fast to mature. White tends to be the most common color in commercial meat lines, but red was the original breed color. Black and ‘broken’ (red or black with white patches) are also acceptable colors. Because New Zealands are large, fast-growing rabbits with a tendency to gain weight quickly, there are a few things to keep in mind when raising these rabbits as pets. According to the House Rabbit Society, all rabbits need an enclosure to be at least 4 to 6 times the size of the rabbit when it is stretched out. Keep in mind, if you are getting a young rabbit, that this rough dimension should be based on the rabbit’s adult size. If they will be spending all day in their cage, it should probably be even larger. An eight square foot (.75 meters squared) enclosure is recommended, and your rabbit should also have time to play outside of their home every day. When raised as pets, another factor to consider is diet. Big rabbits will obviously eat more than smaller breeds, and because New Zealand rabbits have been specially bred over the years to put on lots of weight quickly, special attention should be given to the food they are offered. They should be offered a measured quantity of high-quality rabbit pellet and unlimited timothy hay every day. They can be given leafy vegetables daily, and occasionally can be given special treats like fruit or carrots. More information on basic rabbit dietary requirements can be found here. 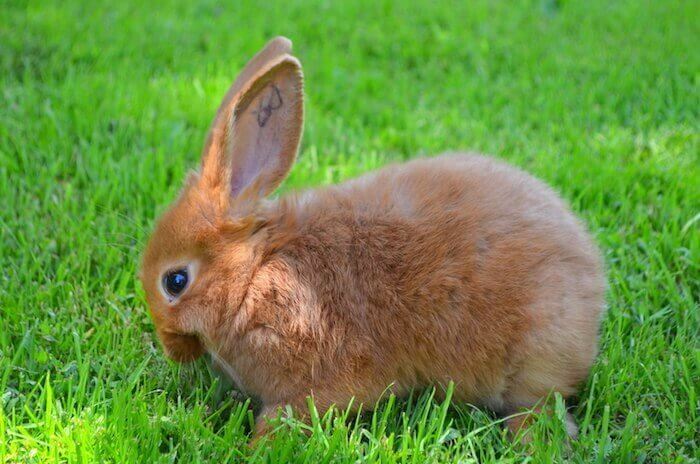 As a breed New Zealand rabbits are relatively healthy and vigorous and so they are generally healthy pets, but there are some things to keep in mind if you are planning on keeping a New Zealand rabbit. Overfeeding can be a big issue for New Zealand rabbits because they are bred to grow to a large size. Too many treats can cause these rabbits to become overweight and can shorten their lifespan. This is especially true of New Zealands that come from ‘production’ lines. New Zealand rabbits can also suffer from infrequent genetic disorders. One such defect causes some rabbits to develop cataracts. It’s important to know, however, that genetic diseases are comparatively rare in this breed, and are avoidable if you plan to buy your rabbit from a reputable breeder. Another thing to keep in mind when choosing a large breed like the New Zealand is where it will be housed. New Zealand rabbits need more space than small rabbit breeds and benefit from daily exercise outside of their cage to help keep them at a good weight. Like all rabbits, New Zealand rabbits are sensitive to heat, and although they can be kept outside in a hutch, it is best to keep them inside where they can benefit from a steady temperature and will get more attention. So do New Zealand rabbits make good pets? Despite being originally developed as a meat rabbit, New Zealands make great pets! They enjoy being part of a family due to their social nature and do well with children and other pets. Because of their calm temperament, they can be housed together with other rabbits, but be sure that each rabbit has enough space to prevent bickering. 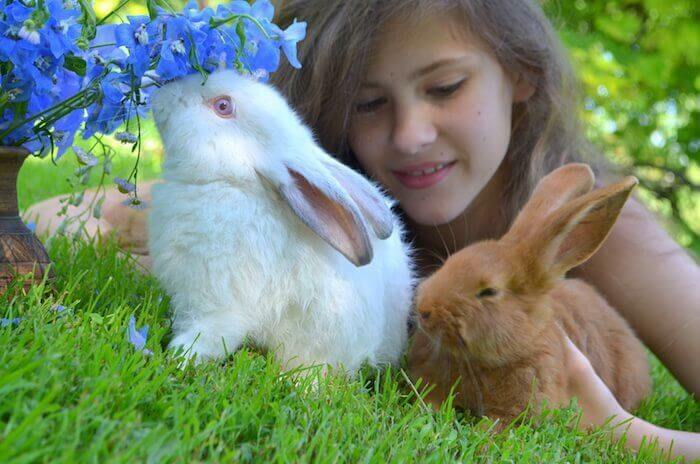 New Zealand rabbits are an especially good choice for anyone who is new to rabbits or for homes with children. Because they are big, they are not as delicate as small breeds, and their hardiness makes them easy to care for. Their short fur requires no special grooming unlike long-haired breeds, and they have very few breed specific diseases. i rescued a new zealand rabbit about 2-3 months ago. he was found on the side of a busy road and the vet and pet shop tried to find his owner but couldn’t. The owner of this pet shop, named him Beefcakes (new friend) knew i loved animals and thought i would be a perfect match for this bunny so she gave him to me. he’s been with me for a few months now has his own room toys little everything he would need, but he seems grumpy. he is very territorial, he beats the cats up and chases the dog. the rabbit is 10lbs the cats about 7-9 lbs and a 80lb dog. so big or small he doesn’t care he fights every one. i dont know what to do i can not and will dont re-home him as he was going to be put to sleep if i didnt take him. any ideas on what to do? I have just gotten a white new Zealand rabbit on Easter and she was just being weaned and I know nothing of proper care for them or if any immigrations are needed and she has been in the house since Easter like a little dog and we are attached and love her so much.